TAMPA — It’s the same front door on the same street. But for Valentine Hendrix, it’s a new start. For nine years, the Belmont Heights home she bought through a government program was beset by fumes from toxic Chinese drywall. By 2016, her air-conditioner was beyond repair and she was working two jobs to pay a $79,000 mortgage on an essentially worthless home. Now, after more than a year in temporary housing, Hendrix and three other families whose properties were also blighted are returning to homes that were rehabilitated through a rescue plan put together by local government agencies. There are no more fumes or sulfurous smells, no blackened wiring or failed appliances. "This was all falling down; this was a mess," said Hendrix, 53, as she showed off her like-new home. "I’m so happy." The four families celebrated their return home this week with a street barbecue attended by Hillsborough County Commissioner Ken Hagan, who led calls for the county to take action after a 2016 Tampa Bay Times investigation exposed the plight of the four families. The county and the city of Tampa combined to raise about $380,000 through housing grants to pay for the repairs, which required the removal and replacement of drywall, plumbing and wiring. The Tampa Housing Authority and Belmont Heights developer Michaels Development Co. provided temporary housing for the families. "This is definitely something we can be very proud of," Hagan said. "Government is frequently at fault; we can be proud that we righted the wrong for these homeowners." Owning her own home was a long-time ambition for Edna Spencer, a social worker with the Florida Department of Children and Families. 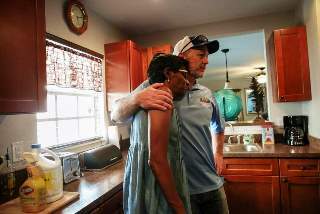 Hillsborough County Commissioner Ken Hagan, right, hugs Valentine Hendrix after taking a tour of her Belmont Heights house on Wednesday, May 9, 2018, in Tampa. Hendrix returned recently to her government subsidized home after three local government agencies financed a rescue plan to clean her house of toxic drywall. It quickly turned to disaster. Drywall fumes eroded her air-conditioner until it finally broke down for good. Her son suffered respiratory problems. Her $175,000 home was valued at $7,000 because of the defective building material. Her son’s health improved as soon as she moved into temporary accommodation. And she was delighted to be back in a home that feels brand new. She and the other families each received a donation of a $3,000 voucher from Rooms To Go to buy new furniture. "This is a blessing to us," she said. "There was no way we were going to fix this." In all, 12 homes in the Belmont Heights redevelopment project built around 2006 were known to be constructed with defective drywall from China, which marred an estimated 100,000 U.S. homes built during last decade’s boom and bust. With down payment help from federal and city grants, the families were encouraged by the Housing Authority to take out mortgages for new homes that cost up to $175,000. Within months, light fixtures and wall sockets stopped working. Air-conditioning units kept breaking down. The families’ health suffered too with residents complaining of headaches, rashes, nosebleeds and breathing difficulties. Eight of the 12 families walked away from their homes, which went into foreclosure. Most of those were bought by developers, rehabilitated and rented out. Those that remained got little help for years. The Housing Authority learned about the problem as early as 2010, records show. It said Michaels Development should fix the homes. Michaels said the blame lay with Banner Homes of Florida, which it hired to build the homes. At that point, Banner had been bankrupt for at least three years. Their long shared ordeal has made friends out the four families who now look out for each other. At the barbecue, donated by 4 Rivers Smokehouse, there were hugs and smiles as they showed off their homes to each other and to friends and relatives. Hendrix is already drawing up plans for how she will decorate the hallway with pictures of her children and grandchildren. In her living room, she has hung a wooden sign that simply says, "Blessed."